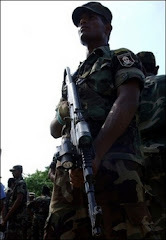 Sri Lanka army's Deep Penetration Unit known as the Long Range Reconnaissance Patrol, today assaulted a rebel vehicle movement deep inside rebel held Mullaithivu region. Rebel vehicle movement from Mallavi to Palappani was interrupted due to the claymore mine explosion set off by the LRRP. The actual target or the result of this DPU attack cannot be revealed for security reasons. LRRP activity in the Mullaithivu region has vastly increased during the recent past. Many unexplained claymore explosions have been occurring in the Mullaithivu in recent past and most of these targeted tiger intelligence wing members. Mullaithivu is a Liberation Tigers of Tamil Eelam (LTTE) stronghold which is highly fortified and it is guarded by elite tiger infantry units. Meanwhile, SLAF Kfir bombers today carried out a bombing sorties over Vallipunam (also located in Mullaithivu district). Target of the air raid was an LTTE training base. LTTE casualty details due to this attacks are yet to be known.